I am aiming this small missive to all the retired officers of Canara bank, who have contributed heftily for the development of this Bank and are pursuing the peaceful retired life with a satisfaction of handed over a performing bank to your juniors like us. Indeed, while entering in to the branch daily, we recall you with a sense of gratitude for having given a performing bank to us to work and to get benefits. You can also feel proud of us that we are keeping our great institution intact, robust and profit making while our contemporaries and comparable are showing negative trend. Your bank shortly is going to cross 6000 branches,54000 employees, ₹8.00 lac crores total business. It also got 11000 young officers and about 6000 young clerks. One of the very few bank maintains a good interpersonal relationship with officers and recently we are the only bank extended Housing loan limit of Rs.50 for a scale I officer to be availed on confirmation at 25% net take home and to be repaid up to 75 years at staff rate. From July onwards an scale I officer in Delhi gets rental ceiling of Rs.20000 per month and at Chennai Rs.17000. Our Bank is planning to design a new HL scheme for the officers who retired too. We are well aware that you all, even after the retirement are showing undiminished interest in knowing the developments in the Industry, but, still I wish to place the following few information on the current scenario of Indian Banking industry. The following disturbing scenario are Hovering around the PSBs. a. the introduction of Payment banks possibly in December 2015.
b. the introduction of Small banks. c. the initiatives of the new generation private banks like ICICI BANK, AXIS BANK AND HDFC BANK in opening branches with advanced technologies in rural and semi urban centres. d. the Govt. insistence to reduce the lending rate which may impose additional pressure on the profitability. e. The Govt. decision to deny the infusion of additional capital to the banks showing the figures lesser than the industry’s average ROE and ROA. f. The Govt. initiatives to introduce structural changes in the PSBs’ administration by nominating Non executive Chairman and MD&CEO from the private sector too. g. The mounting NPA in the advances extended to industrial and infrastructural projects, and now the pressure is being felt in priority sector lending too. h. The loss reported by a peer bank in the last quarter of 2014 – 2015 which is of even size in business. We have got about 11000 young officers today in the system which will be swelling to 17000 in another 3 years due to continuous recruitment to match the retirement. We are able to perceive the situation that in another three years, these young officers are only going to occupy the position in the branches from Scale I to scale III, without much exposure and experience. So, sirs and Madams, you will be agreeing with us, in order to continue to enjoy the pride of Canara bank, we every one of us should immediately to get in action of finding ways to improve the business. Thus we, the CBOA, presently enjoying the membership of beyond 21000 officers decided to offer our service voluntarily to bring new business to the bank. We, the officers grouped under the banner CANPAL with an idea to create a platform for all the officers including Retired to work towards a goal “ INCREASING THE BUSINESS AND IMPROVING THE PROFITS”. We have assigned the following objectives for ourselves and formally launching the mission of achieving this vision in next nine months at our FOUNDER’s PLACE, MANGALORE ON 10TH JULY AND SIMULTANEOUSLY AT ALL THE REGIONS. ₹ 1 lac from each of such customers in SB amassing 2 lac accounts and ₹ 2000 crores new CASA business. If it is ₹10 lacs average, it would be ₹ 20000 crores. 2. Every CBOA member brings 10 housing loans of ₹10 lacs each to achieve 2 lacs fresh accounts with ₹20000 crores. 3. Every CBOA member issues 10 credit cards to issue 2 lacs fresh cards and by ensuring a minimum of ₹10000 per month business through each of such cards to achieve the remittance of 200 crores through the operating accounts. 4. Every CBOA member grants one P&SE account of average ₹ 5 lacs to reach ₹1000 crores. 5. Targeting the loss assets of ₹ 4840 crores numbering 75000 accounts works out to 3.5 accounts approximately per head of every CBOA member and thus adding the entire amount in to net profit. 6. While attacking all the NPA accounts, ensuring no fresh net addition in NPA. 1. Issuing credit cards to 10% of the customers and thus reaching 60 lacs credit card base. 2. Generating ₹10000 fresh income from the 10% of the customers to bring in ₹6000 crores income afresh. 3. Routing all the ECS inward remittances to the operating accounts and credit it to loan accounts through Standing Instructions, wherever required. I am fully aware that we may be having some shortcoming in infrastructures to accomplish this task, but, believe me, not in attitude. We all the 21000 officers members, including 11000 young boys and girls already plunged in to action and the success stories are pouring in which you may browse to know in CANPAL’S CHRONICLES a dedicated FB Group. By spreading this positive vibration and forgetting the adversaries, purely by our voluntary action we believe that we are going to write a new history in PSB’s Annals..
We need your blessings and participation. I am sure that every one of you, who have contributed your entire youth and energy for the well being of this great BANK will come forward to offer your assistance in achieving this Unique Mission. 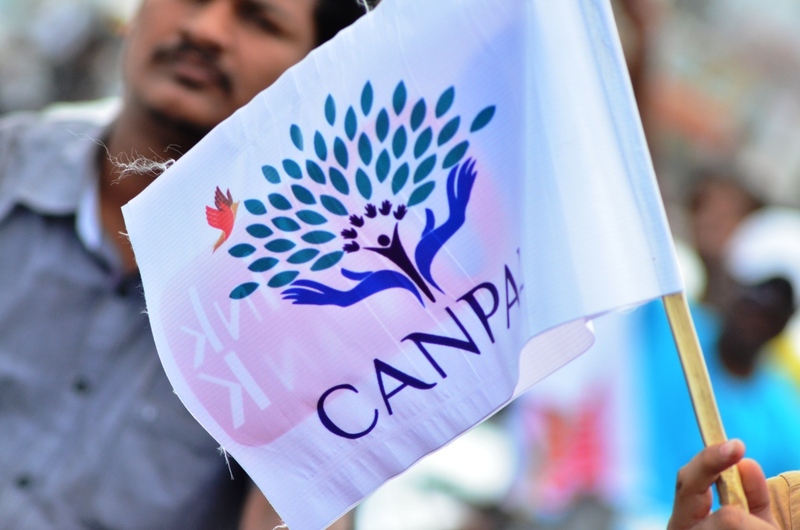 CANPAL’s Product Awareness Programme at Dr.MGR Janaki College of Arts & Science for Women, Chennai.